BEIJING, March 18 (Xinhua) -- As ceremonial music echoed throughout the Great Hall of the People, Xi Jinping took his place on the podium. The music stopped as he reached a large red-bound copy of the country's Constitution. The 64-year-old, in a dark suit, placed his left hand on the Constitution, raised his right hand to his temple and made a fist of solidarity. "I pledge my allegiance to the Constitution," Xi began. "[To] safeguard the Constitution's authority, fulfill my legal obligations, be loyal to the country and the people, be committed and honest in my duty, accept the people's supervision and work hard for a great modern socialist country that is prosperous, strong, democratic, culturally advanced, harmonious and beautiful." He bowed, and the nearly 3,000 National People's Congress (NPC) deputies reacted with a spontaneous burst of thunderous applause. It was the first time a Chinese president had ever taken such an oath upon assuming office. The ceremony was watched by tens of millions of Chinese on television or on their smartphones. On Saturday, Xi was unanimously elected as president of the People's Republic of China (PRC) and chairman of the Central Military Commission of the PRC. Xi first took over the presidency five years ago, pledging to push forward the great cause of socialism with Chinese characteristics, and strive for great rejuvenation of the Chinese nation. "In face of the mighty trend of the times and earnest expectations of the people for a better life, we cannot have the slightest complacency, or get the slightest slack at work," he said back then. China has made historic achievements under Xi's leadership. The unanimous vote shows the strong support he enjoys among the people. Nearly five months ago, Xi was re-elected general secretary of the Communist Party of China (CPC) Central Committee. The Party's 19th National Congress enshrined in the CPC Constitution Xi Jinping Thought on Socialism with Chinese Characteristics for a New Era. The thought was added into the country's Constitution at the 13th NPC session as a guiding principle of the state. People have high expectations for the years ahead. The blueprint laid out at the Party congress is being turned into action plan. "HAPPINESS COMES OUT OF ARDUOUS WORK"
Led by Xi, China is becoming strong. The size of the economy has expanded to more than 82 trillion yuan (around 13 trillion U.S. dollars) from 54 trillion yuan over the past five years, growing by 7.1 percent a year on average. More than 66 million urban new jobs have been created. The economy is healthier. Xi's supply-side structural reform worked. Consumption has become a major growth driver, contributing to 58.8 percent of economic growth last year, up from 54.9 percent five years ago. The share of service sector has climbed to 51.6 percent from 45.3 percent. People live a more comfortable life. More than 68 million people escaped poverty. Personal income increased by 7.4 percent annually on average. Life expectancy reaches 76.7 years, leading developing countries. The environment improves as strict rules on water, soil and air pollution control have been enforced. A remarkable change: over the five years, the number of heavily-polluted days in major cities was halved. Xi made this happen through reform. He is regarded as the chief architect. In the five years, more than 1,500 reform measures were issued, affecting economic, political, social, cultural, environmental fields, national defense and Party building. Government red tape was cut. Foreign investment was made easier. Xi has said happiness comes out of arduous work. A week after the 19th Party congress, Xi took leading officials to the Party's birthplace in Shanghai and Zhejiang, a "roots-tracing" trip to remind cadres of the Party's original aspiration. "The CPC seeks happiness for the Chinese people," Xi said in an NPC session panel discussion. "Whatever issues the people are unhappy about or dissatisfied with, we must work hard to solve them." Xi's deep connection to the people was formed early in his life. Son of a revolutionary leader, Xi, at the age of 15, joined numerous "educated youth" bidding farewell to urban life and heading to the countryside to learn from peasants. 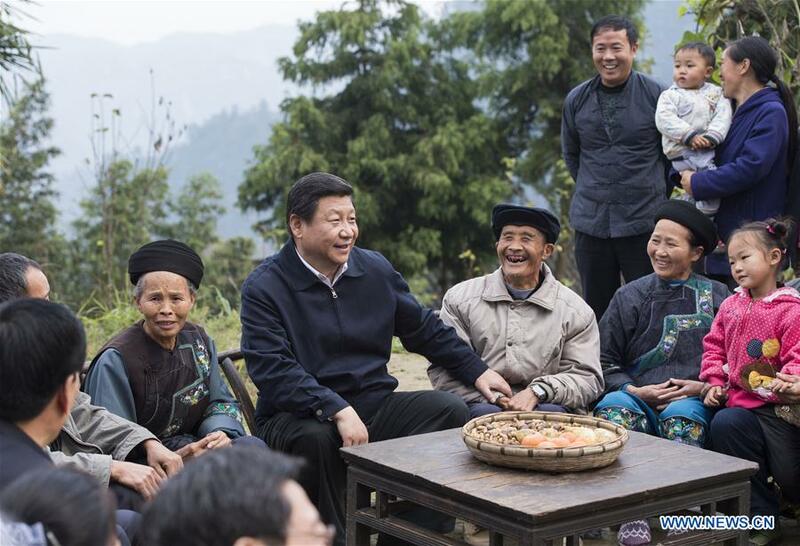 Xi was sent to a small, isolated village in Shaanxi Province and stayed on for seven years. These formative years taught him the real situation on the ground and shaped his belief in pragmatic approach and the mass line. In the following decades, Xi rose from the grassroots to the very top. His work experience in the military, a poor rural county, and wealthy coastal regions enriched his leadership skills. Xi entered the Standing Committee of the Political Bureau of the CPC Central Committee in 2007 and was elected general secretary of the CPC Central Committee in 2012. He has become the core of the CPC Central Committee and the whole Party. In Xi's view, for China to achieve the goals in the new era, the Party' s leadership over every area is the key. To keep the Party clean, he launched an unprecedented anti-corruption campaign, investigating 440 senior officials -- who held provincial or corps level positions or above, among others. Overall, more than 1.5 million officials were punished. "If we had not offended hundreds of corrupt officials, we would have offended 1.3 billion Chinese people," Xi said. While the campaign has built into a crushing tide, Xi said it could not stop. The action to "take out tigers" and "swat flies" continued after the 19th Party congress. Latest fallen high-ranking officials included former head of cyber-space administration Lu Wei, army generals Zhang Yang and Fang Fenghui, as well as former state councilor Yang Jing. He also pushed forward the supervisory system reform, strengthening a centralized and unified leadership of the CPC over the graft fight. Xi has called on officials in charge to "bite the hardest bones and catch the hottest potatoes" to tackle problems. Xi is in the spotlight at the annual sessions of the NPC and the National Committee of the Chinese People's Political Consultative Conference, commonly known as the "two sessions." He stressed adherence to a system of CPC-led multiparty cooperation and political consultation, saying it was a new type of party system growing from China's soil and contributed to the political civilization of humanity. Political advisor and entrepreneur Yu Minhong couldn't agree more. Yu is a member of the China Democratic League (CDL), one of the eight non-communist parties in China. But he is better known as the chairman of New Oriental, a leading education company. For years, Yu has been helping poor rural students get proper schooling. His proposal for rural teacher pay rises led to government policy change. Ding Zhongli, chairman of the CDL Central Committee, said the ruling party and the non-communist parties cooperated quite well under the system, working toward a common goal of national development. Fred Teng, president of the America China Public Affairs Institute, said through the multiparty cooperation system policymakers could draw the best policies and achieve the best results. While joining lawmakers from Guangdong Province in a panel discussion, Xi highlighted development, talent and innovation. Guangdong has been at the front-line of the reform and opening-up. The year 2018 marks the 40th anniversary of the drive, which resulted in consistent and fast economic growth for decades. During an inspection to Jiangsu Province last December, Xi said more emphasis needed to be placed on the economy's quality rather than speed and every industry, every enterprise should follow the change. China is setting sail toward a modernized economy with Xi at the helm. "Xi Jinping Thought on Socialist Economy with Chinese Characteristics for a New Era" was raised at the Central Economic Work Conference last December. The Wall Street Journal reported that China had made "Xiconomics" a guiding principle, with a focus on innovation and high-quality growth. Areas to deepen reform include public institutions, state-owned enterprises, industrial monopolies, property rights protection, taxation, finance, rural development, social security and ecology. A modernized economy is the goal. At the "two sessions," Xi's speeches touched more fields than economy, from Party building, rule of law, poverty reduction to environmental protection, social governance and military-civilian integration. Internet tycoon, Tencent chairman Pony Ma said Xi's speeches were so rich that he took six full pages of notes. "The general secretary said we should make innovation a powerful driver of quality development, and I think it is an insightful remark," he said. "It will be a new opportunity for our innovative enterprises." Li Shumu, an NPC deputy and a village Party chief in the county of Yinan, Shandong Province, said farmers in his village feel encouraged as Xi has drawn a beautiful blueprint for the countryside. Air force officer Liu Rui said the armed forces must firmly adhere to Xi's order to make combat capability the fundamental criterion to judge their work. People are curious about what changes Xi will bring to China and the world. The three years to 2020 are crucial. China aims to complete building a moderately prosperous society by then. Extreme poverty will be history. Looking further ahead, China aims to basically achieve modernization by 2035 and build a great modern socialist country by the middle of the century. Realizing this "Chinese Dream" of national rejuvenation requires policy continuity and hard work. On top of that, China needs an authoritative, centralized, unified leadership. With more than 89 million members, the CPC is driving China toward new economic and social advancement, blazing a brand new trail of socialism. The year 2018 marks the 200th birthday of Karl Marx and the 170th anniversary of the issuance of "The Communist Manifesto." Xi Jinping Thought on Socialism with Chinese Characteristics for a New Era is considered the latest adaptation of Marxism to the Chinese context. A miracle is unfolding -- for the first time in human history, a billion plus people are crossing the threshold of modernization together. Challenges like material shortage and wealth gap will be overcome. People will feel much more fulfilled, happier and safer. Shen Jilan, 89, is a witness to the profound changes over time. Born a farmer in rural Shanxi Province, Shen was first elected to the NPC in 1954 and was re-elected for 12 times in a row. The octogenarian likes to compare her annual commute to the Great Hall of the People over time. In 1954, she spent four days on the back of a donkey, a truck bed and then a train to reach Beijing. Today, the capital is just three hours away by high-speed train. China is indeed on a high-speed train, one that moves toward the full development of human potential, as envisioned by Karl Marx. This explains China's growing relevance to the world. After all, it is exploring a path to advance humanity. This year's "two sessions," like the 19th Party congress, attracted worldwide attention. Analysts credit China's growing influence to the country's system and Xi's charisma. China is an economic powerhouse for the world. At more than 30 percent, China's annual contribution to world economic growth is bigger than that of the United States, Japan and the eurozone combined. China accounts for more than 70 percent of poverty reduction worldwide. It sends the largest group of peacekeepers among the five permanent members of the United Nations Security Council and makes the second largest contribution to the UN peacekeeping budget. China raised the Belt and Road Initiative and other major proposals to champion global governance, free trade and an open global economy. On March 9, Xi had a phone conversation with U.S. President Donald Trump. They discussed the situation on the Korean Peninsula and bilateral relations. Trump said President Xi was right to insist on a dialogue between the United States and the Democratic People's Republic of Korea. The U.S. side highly appreciates and values China's significant role in resolving the Korean Peninsula issue, and is willing to strengthen communication and coordination with China over the issue, according to Trump. Xi-style diplomacy is highly praised for building a new type of major country relations and a "community with a shared future for humanity." Vladimir Petrovsky, a senior researcher at the Institute of Far Eastern Studies of the Russian Academy of Sciences, said a feature of the major country diplomacy with Chinese characteristics is that China raised non-confrontational proposals, which did not lead to clashes but contributed to improving the existing international order. In the past few months, Xi held talks with Trump on bilateral ties, the China-U.S. cooperation on regional and international levels. Key progress has been achieved, consensus reached. Xi maintained close high-level exchange with Russia, pushing for all-round cooperation in all fields and closer communication and coordination on international affairs. After the 19th Party congress, Xi received French President Emmanuel Macron, British Prime Minister Theresa May, and presidents of the Republic of Korea, Djibouti, Gambia and Panama. He visited Vietnam and Laos. At the APEC Economic Leaders' Meeting in Da Nang, Xi called for an economic globalization that is more open and inclusive, more balanced, more equitable and beneficial to all. In December, Beijing held the CPC in Dialogue with World Political Parties High-Level Meeting, attracting over 600 representatives of nearly 300 political parties and organizations from more than 120 countries. Xi told them that people around the world should be one family, open arms, understand each other and build a community with a shared future. He has told Chinese diplomats that the CPC considered it a key mission to both work for Chinese people's happiness and make a greater contribution to humanity. Afghan political analyst Ghulam Dastgir said a community with a shared future was the common pursuit of people around the world and that in pushing for that goal China could create more opportunities for the world and make it thrive. At the Great Hall of the People, with Xi elected as president, history has opened a new chapter.